Specialized dealers around Australia are participating in women’s ride month. Tonight I’m attending a ‘Performance women’s night’ at Jet Cycles in the Sydney CBD and next week I’m helping to organise an event at Ashfield Cycles. I actually started working at Ashfield Cycles a couple of weeks ago as a casual shop assistant and I’m loving it. Here’s the details of the event next week. Ashfield Cycles is hosting an information session just for women cyclists in conjunction with Specialized. 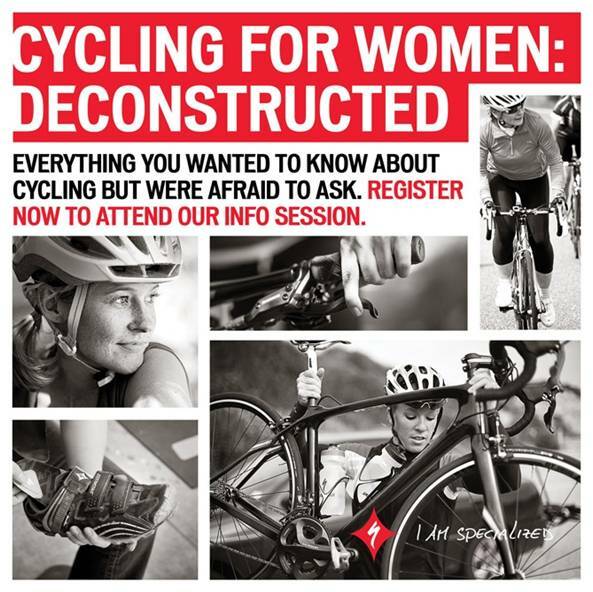 The night session will include discussions about training and setting goals led by coach Donna Meehan, the latest women’s products from Specialized, and bike maintenance. It will also include plenty of chat about how to get more out of cycling no matter what level you’re at. There are information nights and women’s rides happening right around the country. If you want to know more visit the Specialized website.